This is an ELECTRICALLY HEATED COATING CURE OVEN. Precision temperature control through five zones of process to achieve time and temperature characteristics of “High Tech” coatings on ceramic substrates is carried out on a 38 inch wide continuous belt. The oven interior is gas tight welded stainless steel. Process goes to 500° C with maximum 8000 pounds per hour load. 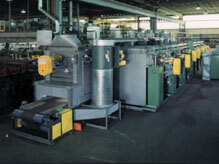 Parts are cooled, on the same continuous belt, to less than 75° C in only seven feet of travel. The system is PLC controlled. Due to critical specs on the process this oven is completely "product” tested in our plant prior to shipping. Overall dimensions are approximately 60 ft. long x 16 ft. wide x 14 ft. high, including work platforms and ladders.